You may purchase products below using our AmeriCommerce secure online shopping cart. Excess used books can be purchased offline here. * Out of print and available print on demand only. May take up to 4 weeks to receive. For foreign orders of all books, please contact RDBeaudry@afgs.org. * Births of Swansea, MA (1879 - 1973). Marriages of Blackstone, MA (1845 - 1995). Marriages of Swansea, MA (1879-1973). Marriages of Upton, MA (1844 - 1905). Marriages of Uxbridge, MA(1844 - 1905). Marriages of Warren, MA(1845 - 1910). Marriages of West Brookfield, MA (1860 - 1910). Marriages of Gardner, MA (1844 - 1915). Marriages of Grafton, MA (1843 - 1905). Marriages of Hopedale, MA (1886 - 1905). Marriages of Marlborough, MA (1842 - 1915). Marriages of Mendon, MA (1844 - 1905). Births of Peterboro, NH (1887 - 1951). Marriages of Peterboro, NH (1887-1948). Burials of St Matthew’s Church (1906 - 1988), Central Falls, Rhode Island. From civil, funeral home and church records found in the Woonsocket, RI area. * Marriages of Ste Cecilia's Church (1910 - 1986), Pawtucket, Rhode Island. * Burials of the Elmwood Memorial/Meuniers Funeral Service(1934 - 1990), Burlington, Vermont. Les Mariages des Iles de Madeleines, PQ., (1794-1900). Quebec, Canada from 1608 to about 1940 for a SPECIFIC SURNAME. The AFGS Surname Marriage CD’s are no longer being produced on demand. Please note: $5 additional shipping and handling each ornament. Rhode Island residents add .84 cents tax per ornament. L'Habitation is an intricately detailed depiction of the first permanent French-Canadian colony founded in Quebec by Samuel de Champlain in 1608. 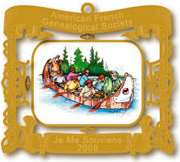 Each exquisite 24kt gold-electroplated collectible is handcrafted of solid brass and beautifully gift-boxed with the AFGS logo embossed in gold on the cover, and includes a short history of this significant first settlement in New France. The Voyageurs is an intricately detailed depiction of the adventurous French Canadian men who traveled by birch bark canoe transporting barter goods, supplies and pelts between Montreal and the vast outreaches of the western wilderness stretching to the Pacific Coast. Each exquisite 24kt gold-electroplated collectible is handcrafted of solid brass. The men in their canoe are depicted in full color. The ornament is beautifully gift-boxed with the AFGS logo embossed in gold on the cover, and includes a short history of the voyageurs and the important role they played in the fur trade that sustained the Canadian economy for over two hundred years. Actual size: 2.5" X 3.5"
Standard Family Group Sheets. 8 1/2" X 11." Places to record pertinent data for a couple and up to 15 children. Reverse side blank for notes and references. Minimum order 100. $3.50 per 100. 5 Generation Chart. 8 1/2" X 11." Standard pedigree chart. Improved version, designed to be either handwritten or typed. Minimum order 100. $3.50 per 100. Eight Generation Family Tree Chart. 23" X 28." Heavy parchment-like stock Shipped in mailing tube. $4.00 Postage US $3.00.